Presidents who claimed to limit government often actually did the opposite. History often looks unfavorably on presidents who may have actually contributed smart and important policies. Were Harding and Coolidge really as ineffective as their reputations maintain? Did Hoover not do enough to end the Depression? Was Reagan a true champion of small-government conservatism? We all know that the American president is one of the most powerful people in the world. But to understand the presidency today we often have to learn from the past. 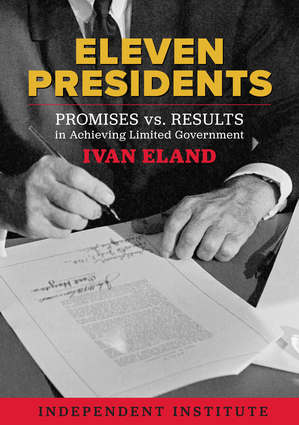 Author Ivan Eland offers a new perspective in Eleven Presidents on the evolution of the executive office by exploring the policies of eleven key presidents who held office over the last one hundred years: Warren G. Harding, Calvin Coolidge, Herbert Hoover, Dwight D. Eisenhower, Richard Nixon, Gerald Ford, Jimmy Carter, Ronald Reagan, George H. W. Bush, Bill Clinton, and George W. Bush. The book combines an exploration of how political currents shape historical legacies with an in-depth analysis of presidents' actual policies. An important, revealing book about the presidency, legacy, and the formation of history, Eleven Presidents is essential reading for understanding the American presidency. Ivan Eland is Senior Fellow and Director of the Center on Peace & Liberty at the Independent Institute. He has been Director of Defense Policy Studies at the Cato Institute, and he spent fifteen years working for Congress on national security issues, including stints as an investigator for the House Foreign Affairs Committee and Principal Defense Analyst at the Congressional Budget Office. He also has served as Evaluator-in-Charge (national security and intelligence) for the US General Accounting Office (now the Government Accountability Office) and has testified on the military and financial aspects of NATO expansion before the Senate Foreign Relations Committee, on the effects of international economic sanctions before that same committee, on CIA oversight before the House Government Reform Committee, and on the creation of the Department of Homeland Security before the Senate Judiciary Committee. Dr. Eland is the author of Partitioning for Peace: An Exit Strategy for Iraq; Recarving Rushmore: Ranking the Presidents on Peace, Prosperity, and Liberty; The Empire Has No Clothes: U.S. Foreign Policy Exposed; Putting "Defense"Back into U.S. Defense Policy; No War for Oil: U.S. Dependency and the Middle East; as well as The Failure of Counterinsurgency: Why Hearts and Minds Are Not Always Won. He is a contributor to numerous volumes and the author of forty-five in-depth studies on national security issues. Dr. Eland is a graduate of Iowa State University and received an M.B.A. in applied economics and a Ph.D. in Public Policy from George Washington University.